Batten down the hatches because your child (or entire family) has a fever, a cough or worse, vomiting and diarrhea. We’ve all been there: sleep-deprived, trying to keep ourselves healthy and prevent the spread of disease in the house of the unwashed. (Not literally, but it can feel that way!) Running out to buy more supplies is simply out of the question. Even if you don’t have kids, the last thing you feel like doing when you or your spouse is sick is driving to the store. 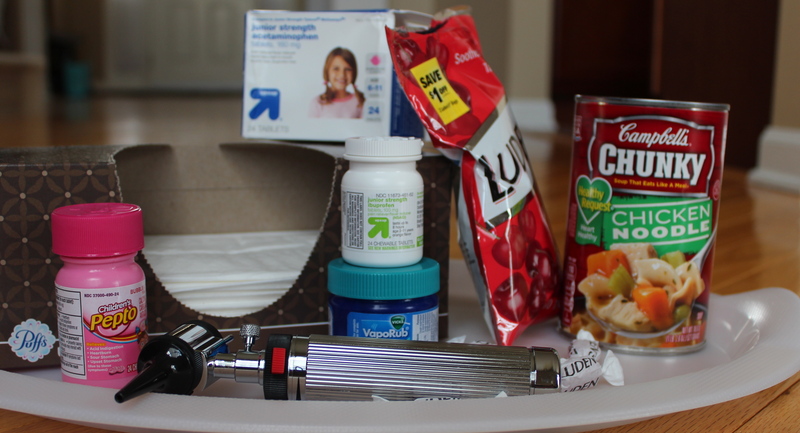 Here is a list of items that you can stockpile while you are healthy and avoid any additional discomfort when the inevitable flu or cold is bound to occur. This list is not entirely comprehensive so please let me know if there is anything you and your family prefer to keep on hand. Section off sick and healthy areas. It will make disinfecting much easier. I allow the child who is sick to be in her room or in the family room with one bathroom that is only hers to use until she is no longer contagious. Keep a notepad and pen handy to write down their temperature, how many times they vomited, etc. It helps keep track of it all when your brain turns to mush and the nurse on the phone needs specifics. This gem is from a mom who said she saved their old crib mattress and lets her child sleep on that instead of her bed. It’s lower to the ground and if they are vomiting, there is less chance for missing the bucket. Good one C! Open the windows. Even if it’s arctic cold, letting some fresh air into the house for a few minutes can help clear the stale air. If you are battling this on your own because your husband is out of town or works late, take up any kind offers from other moms to pick things up while they are out. They really DO want to help and YOU really should not feel guilty for asking them to grab whatever it is you need. It is amazing how moms will band together in times of need and pretty neat to witness. I admit that I need to be better about accepting help myself so this is something to work on. Try to grab a nap or put your feet up if your little one is napping. If that isn’t possible, and believe me I have been there, then delegate some duties to your husband when he gets home so that you can rest. For the children who are healthy and want to play it can be hard to keep them entertained and quiet. Try to have a new book, DVD or game on hand so they can have fun without relying on you to come up with something new to do. Take a deep breath and remember that this too shall pass. 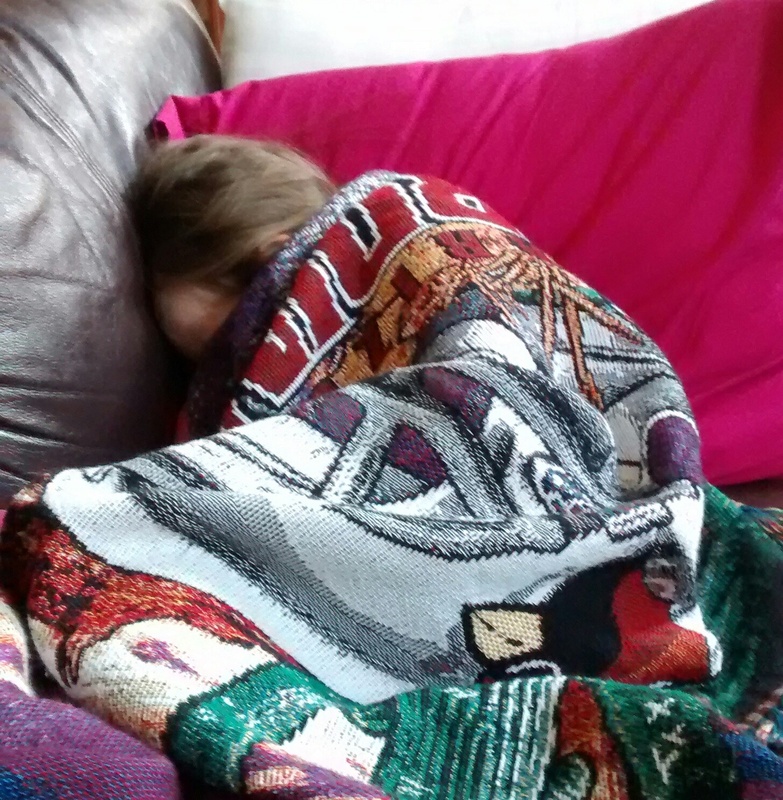 It is stressful and heart-breaking to see your child so sick and helpless. If you’ve been going nonstop all day, treat yourself to a hot shower and a glass of wine when the hubby gets home. You’ve earned it! This post was inspired by the extreme episode of vomiting my oldest experienced last week. Plastic became my new best friend and I don’t think I’ve done that much laundry since she was a baby. She was vomiting about every 15 minutes for 12 hours straight and, at one point, it became projectile. Through her tears she said, “Mom, it was like a fountain coming out of me!” The famous scene from The Exorcist now has nothing on us. Luckily, our doctor finally prescribed some Zofran and that settled her stomach. Be prepared and stay strong out there everyone. 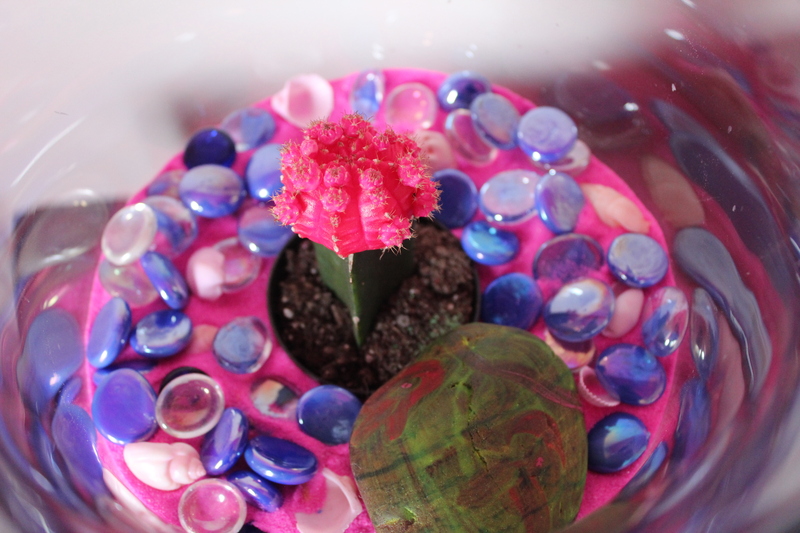 To bring a little life indoors, we created some terrariums this weekend. After doing some research and scouring the house for items we already had, the girls and I were ready to start. I decided to go with planting a cactus and a succulent as they are low maintenance and require watering about every 2 weeks. If you decide to plant moss and ferns, you never need to water your plants, but you will need a terrarium with a lid as well as charcoal to prevent mold. Here are the directions to make your own terrarium. Begin with finding a glass container. This could be a Mason jar, a fish bowl, a wide vase or check your local IKEA or pet store for inexpensive glass containers. Make sure your plants can fit easily inside of it. Add a layer of river rock. Enough to cover the bottom. Supervision of the kids is recommended to ensure they carefully place the stones in the bottom or the glass could chip or break. Use some sand to cover the stones. We had plenty of sand left over from Sydney’s art party so the girls had lots of fun picking which color sand they wanted to layer first, second, etc. 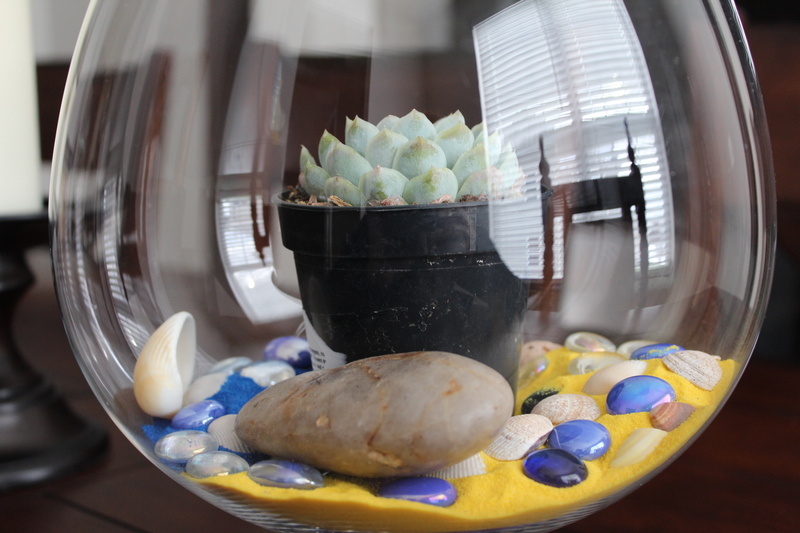 Once you have a flat base in which to place your plant, set it right in the glass with its original planting container. Carefully add more sand around the sides of the container to secure the plant. Try not to let any sand cover your plant. Add finishing decorative touches. 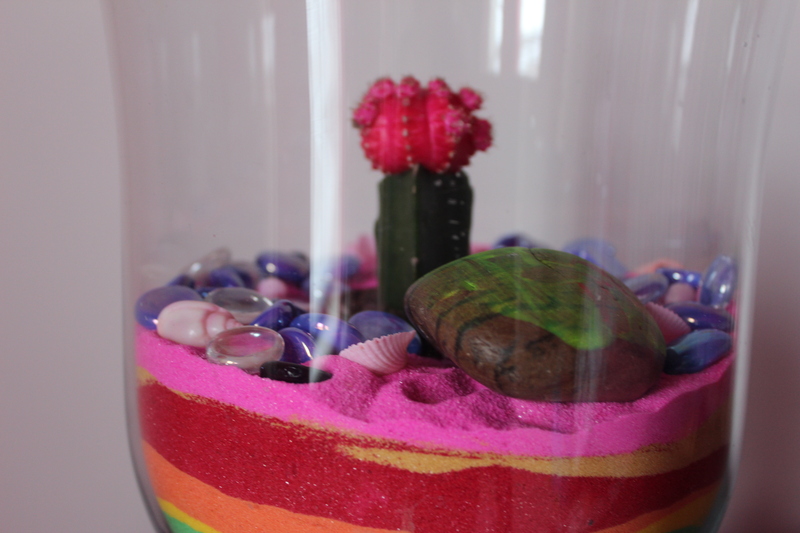 We used pink seashells, blue stones and some large rocks. 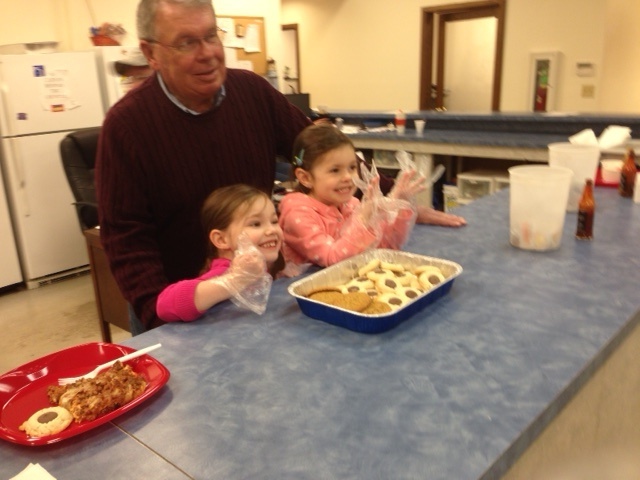 My dad with Sydney and Olivia serving cookies. My family was in town for Thanksgiving so we decided to load up two cars and head over to the soup kitchen on Friday. My dad reluctantly came along. He questioned the idea of helping people who, in his words, “were too lazy to work.” Let me tell you that by the time we drove home, he was singing a completely different tune. Let’s start from the beginning. About a year ago, I was tired of my children begging for the latest toy on T.V. and complaining about the food we ate so it was time for a reality check…for all of us. I admit that I get totally caught up in material things too. A lot of us don’t realize how people are struggling to find food for their next meal and they are literally right around the corner from us. So I Googled ‘soup kitchen’ and The Wayside Center popped up. We have been serving there every fourth Friday of each month since we started in August of 2013. We make the meal at home as well as a side dish and dessert, then we bring it to the center to serve. It brings a smile to everyone’s face when they see Sydney and Olivia passing out the meal. Sometimes Sydney even brings in a little puppet show and the chuckles and grins it elicits is priceless. She brought it on Friday and had all of us laughing-so cute! I was a little hesitant when we first arrived there a year ago. Of course, I want to keep my children safe and we were surrounded by complete strangers, most of them men, and I wondered at first what we were getting ourselves into. These people have since become like family to us in many ways. When I walk in now, a lot of them greet us by name and they always offer to help unload the food from my car. The girls take turns ringing the dinner bell, a prayer is said and then they line up, women and children first (yes, there are children sometimes) and then the men to receive their meal. Let me also state for the record that each meal is earned by doing some kind of chore around the center. If the job is not done, then they don’t receive their meal. Instead of the initial pity that I felt for them, I feel now like we are equals. They appreciate the food that we bring in and I appreciate the opportunity to teach my children respect for all people and appreciation for the little things in life. So on Friday, my mom, dad, brother, and his husband rolled up their sleeves and jumped right in. My dad still held back a bit, but by the end he was chatting with some of the guys that work behind the desk and even thanked me later for the idea of bringing all of us there.